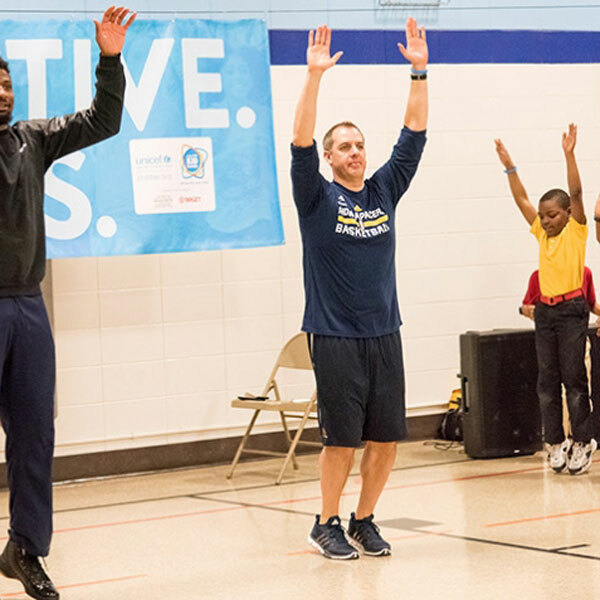 Indiana Pacers head coach Frank Vogel paid a visit to an Indianapolis elementary school this week to encourage kids who are participating in UNICEF’s Kid Power Program. UNICEF Kid Power encourages children to be active in their daily lives by tracking their daily movement with a band. Enough steps unlocks a point, and for every 10 points their team unlocks, UNICEF delivers a lifesaving packet of therapeutic food to malnourished children across the globe. Vogel let the kids know how proud the Pacers were of them and encouraged them to remain being active. He also helped them earn some more points by doing activities with them, then broke off with some and discussed why they wanted to stay healthy, why it was important to be in the program and what activities they would participate in to earn as many points as possible.